It was a late November in the year 1991. My junior high school rented out the local theater in my small hometown. They treated us to a day with Disney and let us all watch the movie Beauty and the Beast. I saw everyone in the theater that was my age all smile, laugh, and even cry to those moments in this movie that demanded all the emotions to come pouring out. For me, a person who grew up on Disney films, it made me feel so awesome and amazed that in this time so crucial in the social development in school that everyone was captivated by the magic of Disney. Now almost twenty years later, I can share this film with my kids and start them out with one of my favorites Beauty and the Beast. 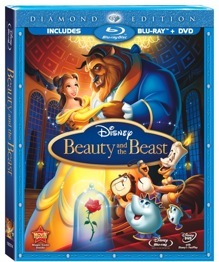 On October 5th, Walt Disney Studios Home Entertainment releases Beauty and the Beast: Diamond Edition on Blu-ray + DVD Combo Pack! 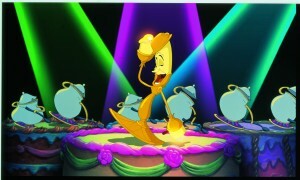 The first animated film to ever be nominated for an Oscar, it features a cast of top vocal talent. Veteran stage actress and singer Paige O’Hara is the voice of Belle, one of Disney’s most beloved and independent heroines, and Robby Benson (TV’s “American Dreams”) delivers a powerful portrayal of the Beast. My daughter has loved Belle since she has been teeny-weeny. My boys loved the Beast and think that he was scary, but saw that he really was kind and had a heart of gold. 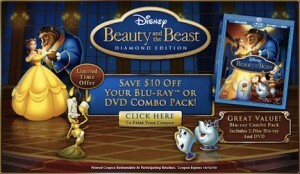 In addition, here’s a special coupon for $10 off the Blu-ray + DVD Combo Pack for this release from Disney Movie Rewards that you can find here! When I was growing up I always looked forward to going over to my grandparents house and having “game night”. We would spend most of the night playing an assortment of card games, tic-tac-toe, and many other board games. I don’t think that it was just the games that I was playing, but the idea that we were all having fun playing an immense amount of games together and having a blast while doing it. I have tried to implement the same thing in our home. These days my kids are so wrapped up in the digital age that it is hard to pull them away from anything that is not on the TV. So, I was curious on how some of my favorite board games would be translated into a digital format to fit into their game playing habits. I received Hasbro Family Game Night 2 for the Wii and popped it in. At first the kids didn’t understand who the characters were or how to play the games, but me being an old school board gamer, I was able to fill them in on such games as Operation, Jenga, Bop-It, Connect 4X4, and Pictureka. When I was younger I loved Operation. I thought it was so interesting that I had to try and save this crazy man’s life and that he had all of these weird parts in his body. What I didn’t like was the loud, scary, bone rattling sound and feeling that came from the game when you hit the side of the incision while going in or coming out. They have really toned that down and made the overall “fun play factor” better. When I used to play Jenga, I used to get mad and want to knock the person laughing at me over like I just made the Jenga tower fall over. Now, in the Game Show setting it is just all around fun that feels less intimidating. My kids did have a little problem getting the hang of it and it may be more suitable for kids around 8 and up. I had a blast though! Pros: Great translation of classic board games with no pieces to clean up after. Cons: Says to be “E” for “Everyone” but my 4 and 6 year old had a real hard time playing it. 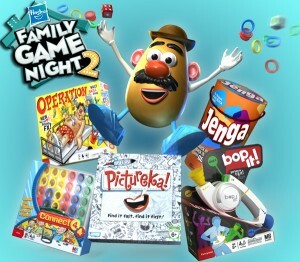 Hasbro Family Game Night 2 for Nintendo Wii is available for purchase for a suggested retail price of $39.99. This year I decided we are going to celebrate Groundhog Day. There is no other day that is devoted entirely to rodents. So, why not take advantage of Groundhog Day to pay homage to ALL rodents of the world. I can see it all coming into play. A huge parade right in the heart of New York City, a new snack mix by Chex that features every known nut in the world, and a week long feature on The Discovery Channel called “Rodent Week”! Ok, maybe some of that is a little premature. But, we can still have fun and honor our furry little friends in so many other ways. On February 2nd, the iconic rodent, Punxsutawney Phil, comes out of hiding and tells the world if there will be six more weeks of winter. This day can be filled with many other activities that revolve around rodents. After watching Phil look for his shadow, families can tune in to see the world’s most famous rodent, Mickey Mouse, on the Disney Channel, watch the movie Groundhog Day with Bill Murray, check out Disney’s The Great Mouse Detective or Pixar’s Rattatoullie. Don’t let the day go by without eating some sort of nuts, cheese, or anything else that rodents eat. 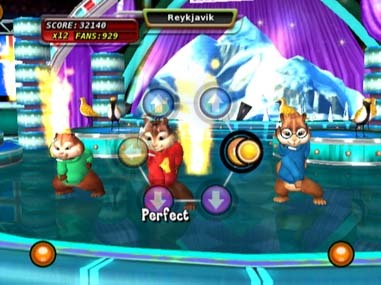 One way we are going to give some love to our four-legged friends is by playing Alvin & The Chipmunks: The Squeakquel video game. We got it for the Wii and it is sort of a cross between a rhythm game and puzzle game. The kids really liked it. Even though it is a little advanced for my 3 year old boy, my 6 year old daughter loved it! Once she got the hang of it though, my son went right beside her and jammed and danced his little rear off! 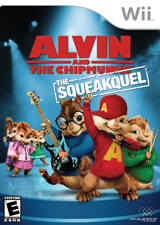 Furry pop sensations Alvin and the Chipmunks are on a spectacular worldwide tour with their girl group rivals, The Chipettes. Watch the ‘Munks bring their mega star power to the show and make the crowds roar! Test your rhythm on stage with these adorable dancing trios as they sing their hits and swing their hips to prove they’re the greatest musical act in the world! • Freedom to switch between unlocked locations with the associated music tracks which feature either The Chipmunks (Alvin, Simon, Theodore) or The Chipettes (Brittany, Jeannette, Eleanor), or a duet by both the bands, each with their own distinct personalities. Make sure to enjoy your celebration of Grounhog Day and let me know what you did to honor our little fur-balls of fun!